Buy.com – Send in $15 rebate (exp. 2/5). 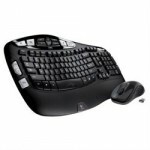 Wave-design ergonomic keyboard with cushioned palm rest for exceptional typing comfort Contoured laser mouse with rubber grips gives you smooth, precise cursor control. Powerful 2.4 GHz wireless connection with one tiny unifying receiver that stays in your notebook.